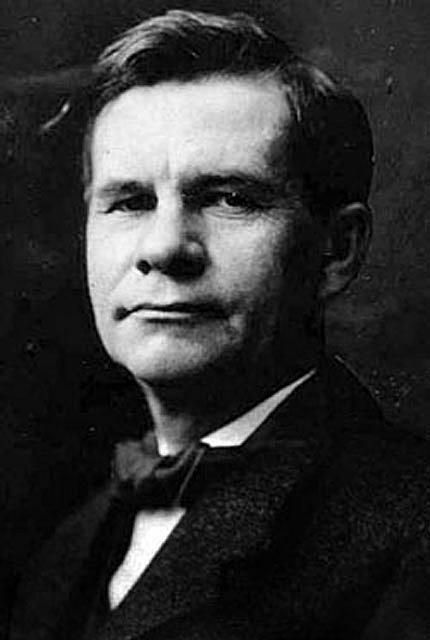 Gustav Stickley (1858?-1942) was an American furniture maker, architect, and publisher. Through his designs and articles, he became a leading advocate of the Arts and Crafts movement, which flourished in the United States around the turn of the 20th century. Based in a suburb of Syracuse, New York, Stickley's company manufactured furniture, metalwork, and textiles from 1900 to 1916. Although Stickley called his style Craftsman, it's also often referred to as Mission or Mission Oak. The word "mission" refers to the California Spanish missions - one of Stickley's design influences - but it also reflects one of Stickley's core values: that all furniture fulfill a purpose or mission. Stickley believed furniture should be rational - that is, well-made, comfortable and practical. He wanted it to be attractive as well but argued that its attractiveness should stem from a harmonious shape and quality materials, instead of superfluous, purely decorative details. The aim of good design (and, in fact, of the entire Arts and Crafts movement) was "to substitute the luxury of taste for the luxury of costliness; to teach that beauty does not imply elaboration or ornament; to employ only those forms and materials which make for simplicity, individually and dignity of effect," he wrote in the debut issue of his magazine The Craftsman. It was through The Craftsman, which ran from 1901 to 1916, that Stickley promoted his principles. Along with articles about other Arts and Crafts advocates and designers, like John Ruskin and William Morris, whom the Morris Chair was named after, the magazine published plans showing readers how to construct their own furniture, handicrafts, and even houses - simple, airy one- or two-story structures, built in harmony with their landscape, and preferably of local materials. With their open, light-filled floor plan, these homes were dubbed "bungalows," a style that remains popular today. Emphasizing clean, rectangular lines, Stickley's pieces display a sturdy, masculine style. Oak was the wood of choice, darkened with ammonia fumes to appear aged or to highlight the natural grain. Seat cushions were made of leather and canvas. While often quite large, the furniture's simplicity, balanced proportions and open-slat back and sides prevent it from seeming oppressively massive. Aside from occasional brass studs, Craftsman furniture is usually free of ornament. However, a few pieces from 1903-04 are adorned with simple metal or light-wood inlays (click on More Images to see photo). These are the work of Harvey Ellis, a young architect who worked with Stickley, drafting both furniture and blueprints for the houses. He died in 1904, but his designs continued to influence the Craftsman line. For several years, Craftsman furniture was extremely popular - so popular that it spawned many imitations and unauthorized knock-offs. In trying to control and keep up with the competition, Stickley (never the shrewdest businessman) overextended his operations. He did so just as the Arts and Crafts movement began to seem like old news, and the public started shifting to "nostalgic" styles, such as Colonial Revival. Stickley declared bankruptcy in 1915, closing down both his business and his magazine a year later - a victim of his own success, in a sense. The late 1980s, however, saw a renewed interest in Craftsman and Mission furniture. Stickley originals began fetching high prices at auction, and modern manufacturers began introducing Mission- and Stickley-inspired pieces. Since Stickley's company operated for less than 20 years, original works in good condition are quite rare. Genuine pieces can be identified by a decal or brand bearing Stickley's shopmark, a joiner's compass with the words "Als ik Kan" (meaning "if I can"), and his signature. On paper labels, the company's name usually appears as well: originally Gustav Stickley Company, then United Crafts, and finally Craftsman Workshops, Eastwood, New York. Gustav Stickley's Craftsman furniture is not to be confused with pieces marked L & J.G. Stickley. These were by Leopold and John George, two of Stickley's brothers, who operated their own factory at the same time, out of Fayetteville, New York. Their work is stylistically similar to Gustav's, and valuable in its own right, though some experts consider it secondary to their more famous brother's designs. After Stickley's bankruptcy, these two brothers purchased his factory, eventually changing their firm's name to Stickley Manufacturing Company. In 1974, this company was acquired by E.J. Audi, one of its dealerships. Under the name Stickley, Audi & Co. this manufacturer/retailer reproduces and provides modern adaptations of Stickley's designs today. Entire rooms of Stickley furniture are on display at Craftsman Farms, Stickley's former home in the Township of Parsippany-Troy Hills, New Jersey, which has been turned into a museum (for more info: stickleymuseum.org). Learn more about the Arts & Crafts movement reading Charles Limbert's Arts & Crafts Furniture and Elbert Hubbard and the Roycroft Community.